Falling for geometry | carpe diem! I cannot resist texture revealed by shadow, lines of light and dark meeting, merging, diverging. And silk does this so very, very well. The subtle shifts of colour in this hand-dyed multi-colour silk blend don’t interfere with my delight; in fact, they almost draw attention to the regularity of the pattern. But blocking/dressing proved far trickier than I expected, even with proper wires and stuff. The comfortable hollows into which we sink gratefully each night are a real nuisance when trying to stretch something evenly across the mattress. It occurred to me that I was producing a model of faster-than-light travel, where the (desired) taut, straight line of the shawl is the same as that taken by an FTL ship skimming above the gravity-deformed bumps and hollows of our everyday universe. Yes, I may have spent a little too long working on it. But I had help for some values of ‘help’. When he started trying to steal the safety pins I gave up and evicted him from the bedroom. The end result is still damp, but drying reasonably quickly, and will make a lovely gift for my sister. I have a minor reservation: the oft-mentioned ‘seaside’ odour of the sea-silk/silk blend is even more noticeable when damp. I’m not keen on it. I don’t hate it, but I think there are people who would; I just hope she’s not one of them. Pattern: Kiri, a free download from All Tangled Up. Yarn: Handmaiden Sea Silk (70% silk, 30% sea cell) in Ivory on 3.75mmm Inox 60cm circular. Dimensions: 1 metre wide by .51 metre deep stretched lightly, unblocked; 1.24 metres wide by .74 metres deep after blocking. Comments: I had two 500m skeins (current skeins are 400m). I knitted this exactly as the pattern (11 repeats plus border) and finished the first skein just before I started the border. I’ve got most of the second skein left. I wish I’d done at least one more pattern repeat, and would recommend anyone using this yarn do so. 1.24metres (4 feet) isn’t a bad width, especially as my sister is smaller than me, but wider would be nicer. On the other hand I can knit a matching scarf with the remaining 400m. Addendum: I just remembered. If you follow the pattern as written, the two sides of the shawl (either side of the centre line) are identical. I decided to make them symmetrical, so on one side all the ‘slip 1, knit 2, psso’ became ‘knit 2 (which I decided to do through the back loop for some reason I don’t understand), return to left needle, pass next stitch over the one just made, slide result to right needle’. This is the first time I have ever changed a pattern just to improve (IMnsHO) the design; I promise I won’t let it go to my head. Next? Well, I have (don’t laugh) 2500 yards of laceweight. Lisa Souza’s superfine merino in the Wild Things colourway, dark blues and purples and greens with occasional flashes of bronze and aqua. I want an everyday shawl for me, something big and warm and not too fussy, partly because I’m not a fussy, frilly, lacy person, and partly because I want the pattern and yarn to complement each other rather than compete for attention. Options include the Kerry Blue Shawl (which doesn’t feel quite right. I know I don’t like the border. 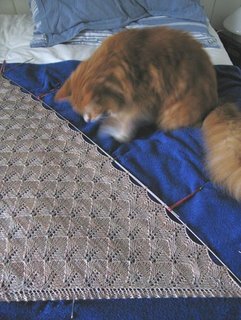 I know, I can change that :-), the Feather and Fan Shawl (Google found several images; here’s one) from A Gathering of Lace (it’s probably too girly), and the Box-Lace Shawl scroll down to July 2005 from Folk Shawls. That last is my first choice, but I’m having trouble choosing a needle size. I’m with Eunny on this; I want a closer fabric. Gossamer doesn’t feel as though it will wear well, and I don’t like huge holes. The garter stitch in my first swatch (3.75mm needles) was too loose, but even when stretched a bit the YOs seemed too small to make the pattern show well. Perhaps the bloom of the wool after washing fills in the garter stitch and makes the YOs stand out? More research is needed; after all, if I’m going to spend several weeks of my life (totalled over a year or more) knitting something, I want to end up with a something that I like. 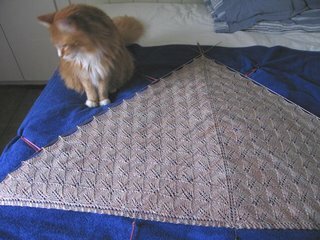 I have to confess I’m also toying with the idea of working out how to ‘double’ the Kiri pattern to make a square shawl. 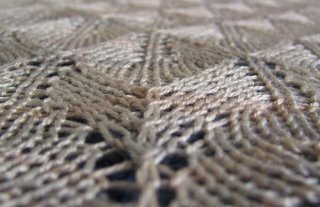 I particularly like the way that lace pattern grows organically out of the centre line (as opposed to the way that the diagonals just ‘cut’ the lace in traditional shawl patterns such as Kerry), even if fuzzy wool wouldn’t show the end result as well as the silk. It’s not so complex that it would argue with the colours, I could add different patterns/borders (the existing one doesn’t feel quite deep enough)… I could talk myself into this. What do you think? This entry was posted in Uncategorized on September 12, 2006 by sarahw. Go for it. I think if you like the pattern you used for the beautiful silk sawl and it would be interesting for you to make a few minor changes and make it up for yourself! It’s tempting. Very tempting. If by any chance you’re tempted too, it’s a very easy pattern. I am going to make more; I’ve just realised I could make one for my mother-in-law in the precise shade of blue/green she loves, but in a hard-wearing everyday wool so she can wrap herself in it on those cooler evenings. I’ve just remembered I made an alteration to the pattern, though! That first photo is just gorgeous! I have to get my hands on some of that seasilk. But first, must pay mortgage. Pity, that. I love that first photo. It’s so full of movement and depth. The shawl is beautiful and I’m sure it will be appreciated (even if it smells – what are sea cells, by the way? )For your own shawl, how about….can’t remember what it’s called. Could be something about shoals. I’ll go and have a look. It’s the shoalwater shawl http://www.fibertrends.com/viewer/patterns/S2011.htmlBut of course, it may not be geometric enough for you. I really really like the seasilk shawl photos. I’d say, knit it again and innovate. You obviously picked a winner there. Oh, and your post to me about pickles was just fantastic! Pickled eggs, huh? Oh, and I like pear chutney…but 6 year old chutney is a little too old, in my opinion, for consumption. Why not make pear jam? pear marmalade? pear butter? or just a pear tart or crumble or three, and freeze? It all sounds yummy to me!